We are associated with many of the world's leading experts in intersection efficiency and sustainable design. All over the nation, planners and residents alike hope to reinvent languishing suburban retail corridors into sustainable, livable, transit and pedestrian-oriented "Places." But their excitement often bumps up against a hard reality: The streets in question often carry huge traffic loads and it is extremely difficult to acquire the space for desired "Complete Streets." Engineers charged with managing the street simply will not accept form over function - and in truth, to be truly livable and to sustain desired TOD densities, these intersections need to flow well. The Quadrant Roadway Intersection is a revolutionary breakthrough that allows both form and function. Place-Making Form AND Engineering Function! Have you ever pulled up to a left-turn pocket stacked a block back, and been tempted to cut through a parking lot or take a back-way to make your left? A quadrant roadway formalizes this creative way to make a left. 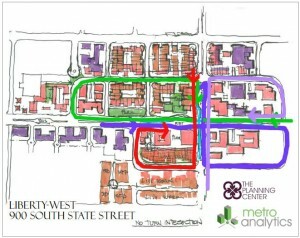 All that is necessary is a road behind existing development on one of the four "quadrants" of the intersection, and then left-turning traffic can be routed on that quadrant. That allows you to eliminate left-turn pockets at the main intersection, releasing anywhere from 12-28 feet of right-of-way to be used as a transitway, bikeway, or in any other way that the best Complete Streets architects can invent! Because the main intersection no longer needs left-turn arrows, it runs much more efficiently - able to support the additional traffic with less delay that is generated by new transit-oriented uses. "Additional traffic" need not mean the street is "auto-oriented." Speed limits can be slower, and average speeds will still be faster, if traffic isn't getting stacked back for blocks. Quadrants make it easier and safer for pedestrians to cross, and they also make it possible for cars to access buildings from the back street, so you can eliminate driveways and encourage buildings to share walls and front sidewalk. There are innumerable intersections across America that can be upgraded to a QRI using existing "back-way" streets, or by developing such streets through existing parking lots or behind languishing big-boxes. Quadrants are one of the key tools for successfully rejuvenating worn-down strip-mall intersections into the 21st Century's Town Centers and Livable TOD Corridors. Quadrants: A "Get Out of Jail Free" Card! The QRI is extremely versatile. The required back-ways can initially operate however you want them to: right-in/right-out only, or all or just some of the lefts. It is not necessary to eliminate all or even any lefts from the main intersection. View them as "get out of jail free" cards. If you establish the footprint when Greenfield land uses first emerge, or when a quadrant redevelops, then you have a super-low cost strategy to relieve congestion, should that ever prove necessary, simply by changing vehicle routing. Start out with traditional operations if that's what is politically possible at the moment. Then if in 10-years traffic is getting intolerable, or if someone wants to use more space for transit, bikes, or pedestrian features. If you insisted that developers build those backways, then you've got options! UPS drivers are instructed to make three rights rather than a left. Why? Even though it is longer, it saves them time! It's called a "mini-cloverleaf," - similar to a clover-leaf freeway interchange, but on a small scale and with development inside each "leaf". Or it can be operated similar to a Continuous Flow Intersection, where people use a mid-block intersection, but instead go behind existing development. Up to 40% more capacity! Former lefts reclaimed for center-running transit, pedestrian refuge, etc. 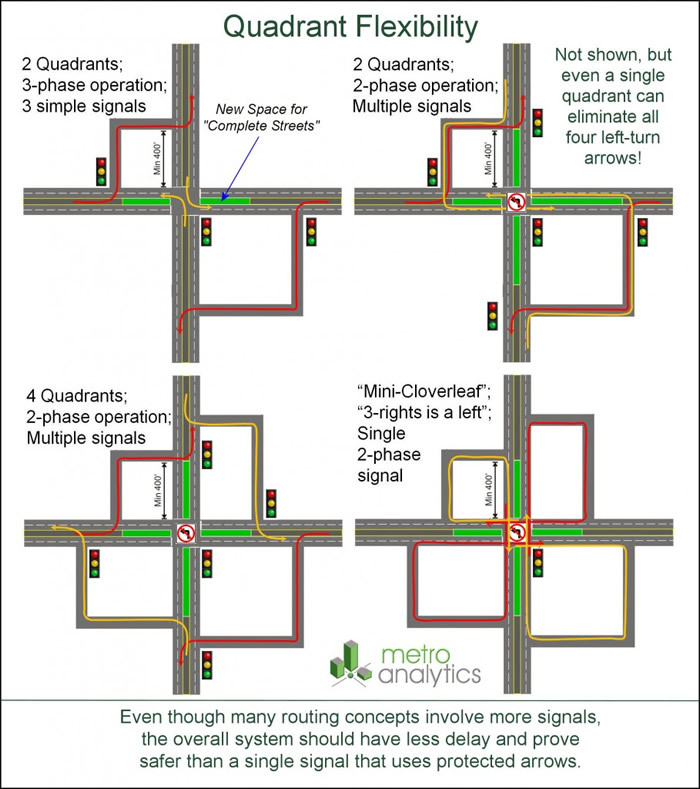 Quadrant Roadways, along with several cousins such as the Town Center Intersection, Continuous Flow Intersection, Through-Turn Intersections, and others are among a series of concepts collectively known as Alternative Intersections, Alternative Intersections, or even Unconventional Intersections. The key trait that links all Innovative Intersections is that they successfully eliminate the "left-turn arrow" phase, which otherwise reduces intersection efficiency considerably. Quadrants and other Alternative Intersections can all be found at www.alternativeintersections.org, where you can search for every Alternative Intersection that exists or has been planned anywhere in the world (or at least those that our members have told us of). 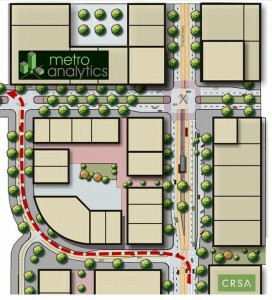 This site as well as www.alternativeintersections.org, are sponsored by www.metroanalytics.com. Please contact Metro Analytics for more information or to arrange a presentation on how these concepts could help you.